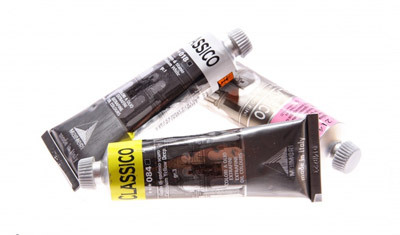 Artists who pick up a tube of Classico Oil Colours will find in it just what they need — the artist’s daily bread and butter. These oil colours are versatile, offering an unsurpassed price-to-quality ratio. Produced by strict principles that yield a top-quality product, they revolutionize the criteria by which an economical (rated “fine”) range is judged. They contain no waxes or thickeners, and no manufacturing shortcuts. The colour palette includes the best original natural Earth and true Cadmium pigments. Average pigment concentration is very high, and the formulas have been perfected to balance the drying times of all colours. Bright, lively colours with overall harmony in the palette, All colours may be intermixed in any ratio or proportion, without limits. Thanks to Maimeri’s vast experience, Classico Oil Colours have become the daily workhorse of a whole generation of artists.